A drainback system is a closed-loop, active solar system not to be confused with a draindown system. The solar loop uses distilled water as its heat transfer fluid and it is a non-pressurize loop. A drainback tank is installed on the return side of the solar loop so that when the system does not run, the water collects in the tanks leaving the collectors empty and so removing dangers from freezing. A drainback system requires very careful installation. Each collector and pipe run must be sloped a least 1/4 inch per foot of run. If the installer avoids any horizontal runs or sags in the pipe where water can pool or back up, a drainback system can provide years of fool proof freeze protection and high efficiency with little to no maintenance. 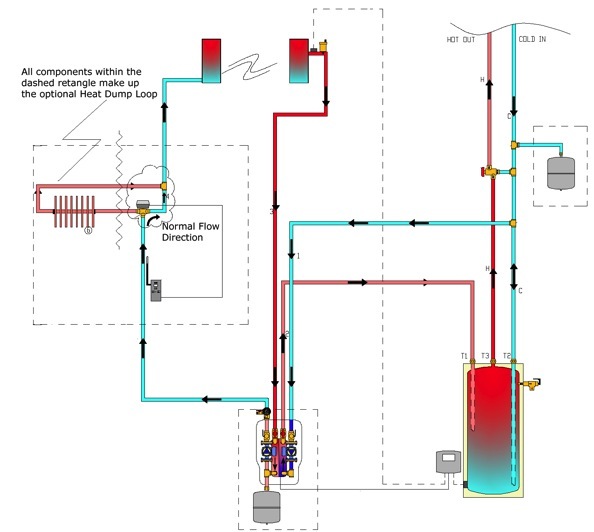 A glycol system is a closed-loop, active solar system. It uses a pressurized solar loop with food grade propylene glycol as the heat transfer fluid. The glycol system is very versatile, great for ground mounted systems or other situations where the pipe runs can not sloped the requisite amount for a drainback system. A glycol system needs to be sized carefully to avoid excessive overheating. The heat transfer fluid must be changed every 3-5 years. In areas of the country where the temperature never falls below 42 degrees F(wind can cause freezing before the air temperature reaches 32°), an open loop system is an economical and easy choice. 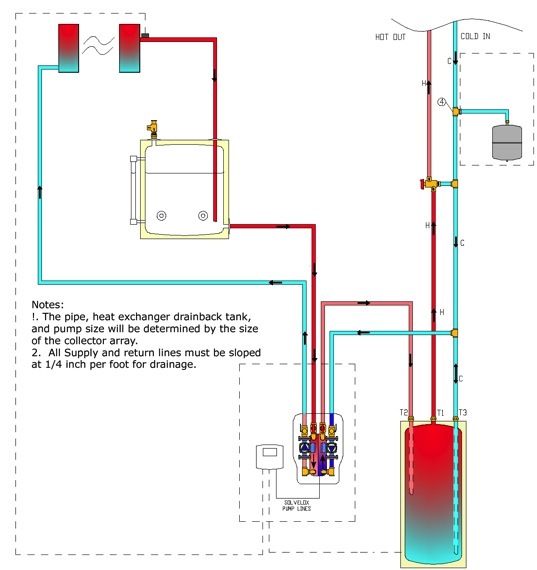 An open loop system runs the potable water directly through the collectors and stores the hot water in a standard water heater.